The DC Densha de GO! 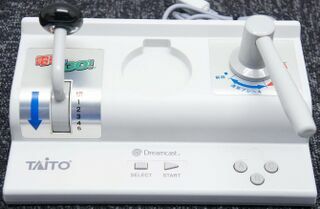 Controller (DC 電車でＧＯ！ コントローラ) is a special controller for the Sega Dreamcast released exclusively in Japan. It is a train controller, built for Densha de Go! 2: Kousoku-hen 3000 Bandai, a train simulator. It was released in 2000 by Taito.